Get Packed Pty Ltd supplies a complete range of automatic and semi automatic strapping machines, hand held battery operated strapping tools as well as manual tools including tensioners and sealers. Strapping is most often used to hold together or bundle packages so that they are held securely ready for transport or storage as well as providing additional strength for heavy or awkward packages. Get Packed also supplies strapping in steel, plastic (polypropylene) and polyester that can be used with all of the strapping machines and tools. Whatever the specifications, we can supply the highest quality semi and fully automatic strapping machines from an economy model to a world-class innovative high speed model. With a range of strap sizes and dimensions Get Packed has strapping machines to suit all purposes. 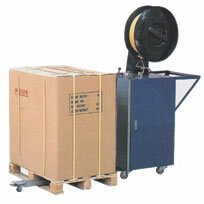 Tthis semi automatic strapping machine with the roll of strapping enclosed, is set at a standard height of 730mm.To strap an item you place it on the strapping table, feed the strap over the package and through to the strapping head, which hits the trigger and pulls the strap back in reverse, tensions, heat seals and cuts the strap. Then it feeds the strap through again ready for use. This machine uses polypropylene strapping in 12mm x 3000mm rolls which is also available from Get Packed Pty Ltd.
How to load a strapping machine. Otherwise view the other video's below to see the strapping machine in use. With an adjustable table height and an open side, this Semi Automatic Strapping Machin can be adjusted from 730mm to 850mm to best suit the operator. 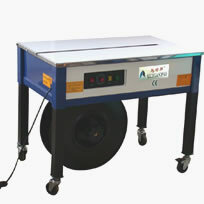 It is an easy to use and highly efficient strapping machine. To strap an item you place it on the strapping table, feed the strap over your package, through to the strapping head, which hits the trigger and pulls the strap back in reverse, tensions, heat seals and cuts the strap. Then it feeds the strap through again ready for use. This machine uses polypropylene strapping in 12mm x 3000m rolls which is also available from Get Packed Pty Ltd.
Only set at a height of 460mm this Semi Automatic Low Table strapping machine is ideally suited for items that you don’t want to lift off the ground for any distance – like heavy or tall items. To strap an item you place it on the strapping table, feed the strap over your package and through to the strapping head, which hits the trigger and pulls the strap back in reverse, tensions, heat seals and cuts the strap. Then it feeds the strap through again ready for use. 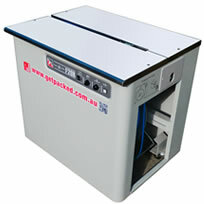 This machine uses polypropylene strapping in 12mm x 3000m rolls which is also available from Get Packed Pty Ltd.
Strapping items from the side this Semi Automatic Strapping Machine has an adjustable work table making it ideal for bundling planks of wood, large bundles of flowers, and any other item where falling particles could drop onto and interrupt the sealing head. This machines high environmental adaptability, also makes it widely used in the frozen food industry as it has the adjustable work table that can be moved up or down it also makes it perfect for heavy products and easily adaptable for the operator. 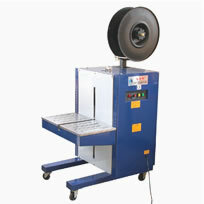 This Semi Automatic Strapping Machine is a simple alternative for strapping pallets without the need for hand tools. This machine is simply moved along side the pallet and the horizontal bayonet which holds the strapping is slipped through the void in the pallet where the strap is then fed over the pallet and back into the machine which hits the trigger and pulls the strap back in reverse, tensions, heat seals and cuts the strap. Then it feeds the strap through again ready for use. 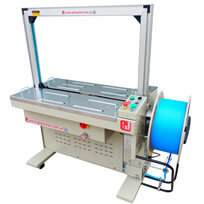 This machine uses polypropylene strapping in 12mm x 3000m rolls which is also available from Get Packed Pty Ltd. The Ergopack is a portable battery operated Pallet Strapping machine that will last between 100 - 400 pallet strapping cycles before needing to be recharged. It takes approximately 6 hours to recharge - making it an easy overnight job, and being portable means it can be used anywhere in the warehouse. The Ergopack allows for a single operator to strap a pallet without bending down to feed strap under the pallet. It uses a revolutionary chain lance that dispenses the strap that goes under the pallet then vertical up the back of the pallet and returning across the top to the operator who takes the strap and tensions / seals it with the Battery Powered Strapping Tool. Watch the video below to see how quick and easy the Ergopack is to use. The GoodPack Automatic Strapping Machine allows for a hands free operation which improves production speeds and accuracy rates as it uses a sensor roller on the table top to automatically activate the strap cycle. This model also features a manual mode with the use of either a foot pedal or table mounted button to activate the strapping cycle. Simply place your package on the table and press the button or foot pedal (in manual mode) or allow it to work in automatic mode and the strap is electronically tensioned, cut and sealed and automatically re-feeds. 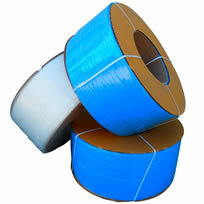 Offering a high speed strapping solution the world class GPTP-601D has optimal performance with polypropylene strapping. It is a cost effective solution for the warehouse and logistics where speed and efficiency is the top priority. On this model the conventional limit switch on the strapping head has been replaced with two proximity switches as well as easy strapping tension managed with a turn of the dial. Get Packed Pty Ltd provides a wide range of battery powered strapping tools, electrically powered strapping tools and pneumatically powered Strapping Tools that are all hand held. Each of the tools are for use with plastic or polyester strapping and built with automatic tensioning and high friction sealing in order to provide a reliable seal without the need for metal seals or buckles. Different models are available depending on the power required of the hand strapping tool and the strap width being used. 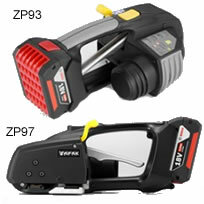 The Zapak ZP93A and 97A (third eneration) hand held cordless battery powered strapping tools is built with automatic tensioning and high friction sealing in order to provide a reliable seal without the need for metal seals or buckles as well as a pre-programmed touch panel to perform even more precisely. Superceding the ZP96A and weighing only 3.5Kg's the Zapak 93A is a standard model with a maximum tension of 250Kgs and the Zapak 97A is the heavy duty model with a maximum tension of 400Kgs. 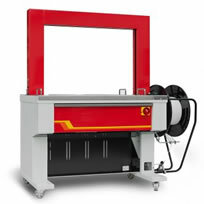 See the brochure below for more specific specifications for each model. Like the Zapak, the ZenithPack cordless battery powered hand held strapping tool is used for tensioning and sealing by way of friction weld of plastic strapping (polyester or polypropylene). 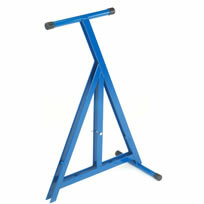 It weighs in at 3.3Kg's with a maximum tension force of 2800N making it suitable for pallets around 300Kg's or less. It is powered using a lithium battery (3.0Aih 2VCD) and can be charged in approx 90 minutes providing between 100-220 straps per charge. The Zapak ZP20 Electric Powered Hand Strapping Tool is suitable for Plastic (Polypropylene) Strapping in widths of 10mm to 16mm. Like the Battery Powered Hand Strapping Tools it is built with automatic tensioning and high friction sealing in order to provide a reliable seal without the need for metal seals or buckles. 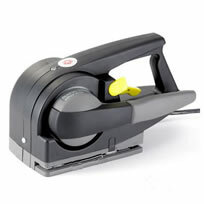 It has an adjustable sealing time for various strap specifications and a cutting blade that can be easily changed. 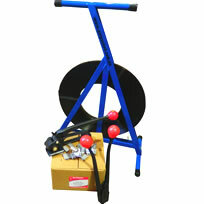 A balancer hanger is also included for vertical strapping. The Zapak ZP20 supplies a reliable manual tension up to 100kgs. 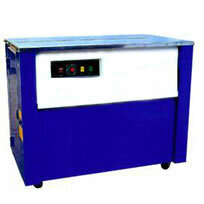 It is perfect for an office, light duty industrial sites and commercial packing. The Zapak28 Pneumatic High Tension Plastic Strapping Tool is the most powerful and reliable plastic strapping tool of the range. 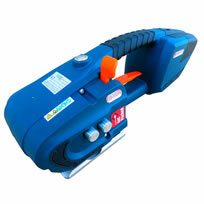 It is ideal for heavy duty plastic strapping jobs as it has a maximum adjustable tension of up to 350kg’s. It is an ergonomically designed light weight and durable strapping tool that has a patented single motor structure and alloyed magnesium aluminium mechanism. It also has a built in safety device for tension setting to avoid scratching and breaking the strap. It is suitable for both plastic (polypropylene) and polyester strap of 16mm and 19mm and adjustable sealing times for various strap specifications. As it is a pneumatic tool it has a number of features that allow free movement of the machine around the hose including an optional swivel air in-take. 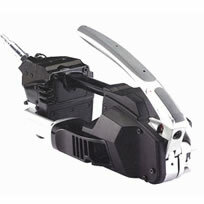 It has easy one-step strap insertion and a user changeable strap cutting blade and other wearing parts. It is ideal for heavy duty pallet consignment, paper, bricks and lumber. Get Packed Pty Ltd supplies a wide range of strapping, seals, buckles and hand tensioners that compliment our range of strapping products. 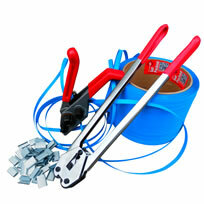 We provide steel strapping, plastic (polypropylene) strapping, polyester strapping and plastic strapping. 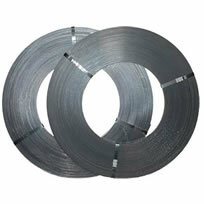 Our steel strapping is available in a standard grade for standard palletising applications. Our Polyester Strapping, which can replace steel strapping in most applications, does not only cost less than steel strapping it can also be easier and safer to use. It also has no sharp edges, does not rust or stain packs or pallets and is UV resistant. Our Plastic (polypropylene) machine strapping is available in automatic grade to suit all strapping machines and has small variations in width and curvature so that it travels through the semi and automatic strapping machines smoothly. This machine strap can also be custom printed or coloured to suit your requirements. We also supply plastic hand strapping which is perfect for sealing boxes or articles together and is used with a manual strapping tool. It is also embossed to prevent slipping of the seals and buckles and comes in a heavy band with a much greater breaking strain. 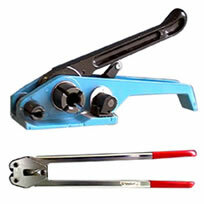 The Tensioner is used to tighten or tension the strapping using a simple ratchet mechanism before a metal seal is applied and sealed or crimped with the Sealer. The Tensioner also has a cutter unit that can cut the strap after the seal has been applied. Polyester Strapping can be used to replace steel strapping in most applications - so its even better that the Kit has been put together for you. The Tensioner is used to tension/tighten the poly strap around the carton or pallet using a simple ratchet mechanism before the serrated seal is applied with the poly sealer. 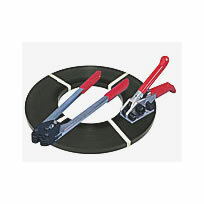 The Sealer is used to crimp or seal the serrated seals to the strapping to create a solid hold. The Tensioner can then be used to cut the strap once the seal has been made. 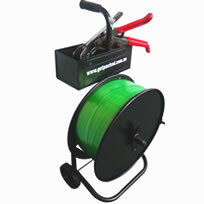 Polypropylene (or plastic) hand strap comes in 12mm x 1000m, 15mm x 1000m & 19mm x 1000m in a convenient dispenser box. The strap is embossed to prevent slipping of seals and buckles with the 15mm and 19mm (400kg B.S) strap coming in a heavy band which has a much greater breaking strain. Plastic (polypropylene) machine strap comes in either white or blue the most common size being 12mm x 3000m and has a breaking strain of 100kg – 120kg. It is available in automatic grade to suit all strapping machines and has very small variations in width and curvature so that it travels through the semi and automatic strapping machines smoothly. We can custom print and or colour the machine strap to suit your requirements. 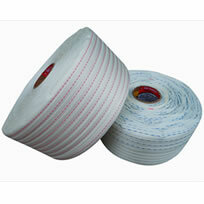 Polyester Strapping can replace steel strapping in most applications. It not only costs less than steel strapping but it can also be safer and easier to use. 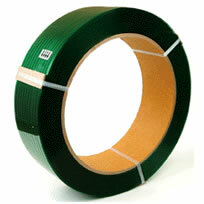 Polyester strapping has no sharp edges, doesn't rust or stain packs or pallets and is UV resistant. It is available in various thicknesses and comes either embossed or smooth. The Polyester strap can be used by both manual hand tools and the battery, electric or pneumatic powered hand tools like the Zapak range. Being similar to a seat belt in a car or strap to tie down a load on a truck - Woven Polyester Strapping gets its strength from its polyester fibres that are woven together which include an added stiffening agent. It has a breaking strain the same as steel or metal strapping whilst being a much safer product to handle as it's without sharp edges. Polyester woven strap also has a high capacity to absorb shocks during transport as well as being weather and chemical resistant. 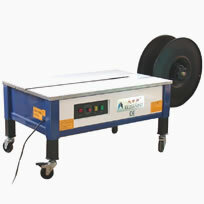 Ideal for Polyester Strapping, this Strapping Dispenser has a 406mm diameter core. It features wheels and a storage tray that can fit your seals and strapping tools and is also the ideal size to hold your Zapak Battery Operated Strapping Tool. Steel strapping comes in either Ribbon (RIB) form which are small hand rolls or ROPE form which are longer industrial roles and is available in 12mm, 15mm 19mm and 32mm. Steel strapping comes in a standard grade for everyday palletizing or high tensile heat treated strap for heavy duty palletizing applications. 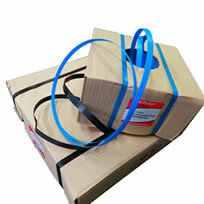 Get Packed Pty Ltd also supplies strapping dispensers for both the RIB and ROPE form. 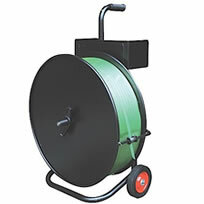 Dispenser ideal for both ROPE and RIB Steel strapping. 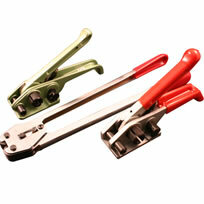 We supply 12mm, 15mm and 19mm Crimper/Sealers as well asTensioners which are used to tighten the strap. How it is used: The end of the strap is tightly gripped by a square gripper plate and using a ratchet motion the strap is tensioned so that a seal can be added. A sealer or crimper is placed onto the seal and then pulled to emboss or crimp the seal that joins the strap. The tensioner has a built in cutter which cuts the strap after it has been sealed. Click on the shopping cart below for the full range. How it is used:The end of the strap is gripped tightly by a square gripper plate and using a ratchet motion the strap is tensioned so that a seal can be added. A sealer or crimper is placed onto the seal and then pulled to emboss or crimp the seal that joins the strap. The tensioner has a built in cutter which cuts the strap after it has been sealed. Click on the shopping cart below for the full range. 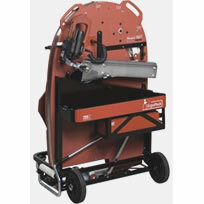 Steel Strapping Tensioners and Sealers are required for manual strapping applications. Steel Strapping Tensioners use a feed wheel tensioner to tighten steel strapping around the bundle or pallet. A sealer or crimper is placed onto the seal then pulled together to emboss or crimp into the seal – thereby sealing the steel strapping. A stel cutting tool is then used to cut the strap. Click on the shopping cart below for the full range. 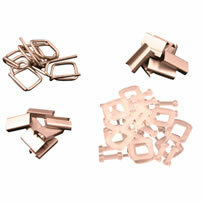 Get Packed supplies metal seals for polypropylene, polyester and steel strap in various sizes and styles. The seals are designed to be used with a sealer or crimper that crimps the seal to the strap thereby forming a join in the strap. Also supplied are wire (metal) or plastic buckles which can be used without the need for tools, although a tensioner can be used to tension the strap.